This beautiful and unique Christmas card is professionally printed with a scene from one of my original wool paintings. It features a winter setting, with snowflakes falling on a delightful fir tree that has been decorated for Christmas with cheerfully wrapped presents nearby. 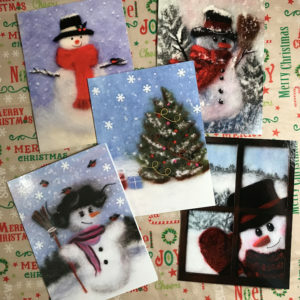 Buy just one card or snag a set if you’re planning to send your own unique season’s greetings to several people.